When it comes to superheroes, I generally find the non-powered guys more interesting. Batman is better than Superman, and Wildcat is better than, say, Starman. I like Wildcat enough that I'd even consider tracking down his first appearance... if it weren't in Sensation Comics #1, the same book that saw a little character named Wonder Woman leave her island home and journey to man's world. Ted Grant was a heavyweight boxing champion in the 1930s. He became a fugitive when mobsters framed him for murder in the ring. Ted donned a black costume and, adopting the name Wildcat, used his combat skills to beat a confession out of the men who framed him. Wildcat decided to remain in costume and focused his attention on mob-related crime. In his civilian identity, Ted Grant has operated a gym and trained Batman, Black Canary, and Catwoman in hand-to-hand combat arts. 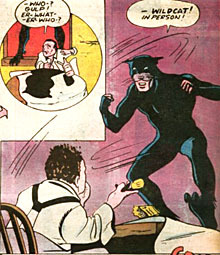 Wildcat was created by Bill Finger and Irwin Hasen. Hasen had created The Fox for Archie Comics (the same one we talked about in the ShadowHawk review), and Bill Finger, of course, is the guy who did all the work Bob Kane took credit for in creating Batman. So here we have an animal-themed guy in a dark suit? How groundbreaking! And if that weren't enough, he was inspired to become a hero after hearing about Green Lantern - DC figured the best way to convince kids their heroes were cool back then was to have other heroes talking them up. Judging by the Γ-shaped hole in his back, Wildcat uses the larger DCU body. 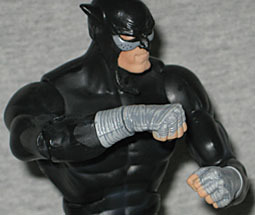 As much as we pick on Mattel for only painting on costume details, rather than sculpting them, Wildcat is an example of that plan working perfectly: since the body of his costume is entirely featureless, there's nothing that needed to be sculpted; however, the Four Horsemen did give us at least a little bit of love; he not only has the clawed feet his costume has sported since its first appearance, the wraps on his fists and forearms are fully sculpted. Meaning that, yes, he has new forearms - ones that are unlikely to see much re-use in the future. It goes without saying that the head is new, but it does turn out looking great. Ted's got a nice square jaw, befitting a boxer, and his mouth is set with a look of grim determination - it's pulled back at the corners, though he's not really frowning, and one side is higher than the other. Originally, Wildcat's mask has large tufts of fur trailing off the jaw, but these days they're normally drawn as loose straps for some reason, and that's what the figure shows us, as well. Wildcat is one of the two figures in Series 9 to have a variant. While the two Mantis figures are quite distinct, Ted just gets a change of color. The version in this review, the standard, is black; the variant is blue. Why blue? Well, best as we can tell, it's because comic coloring used to be crappy, and black costumes were often rendered as blue. But that doesn't really fly, here, because in his first appearance, Wildcat really was colored black, with just a few blue highlights. So what's the story? There's a variant of Wildcat's BAF piece, as well, but it was unintentional. He comes with Chemo's head and chest, which is an entirely unarticulated piece that stands 4¼" tall. 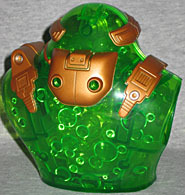 It's translucent green, with bronze/brass elements on the surface. The inside face of the external "skin" is sculpted with bubbles, and there's a separate insert with more sculpted bubbles that rests in the center of the piece. However, due to a production error, a not-insignificant number of Chemos shipped without the second bubbly insert, leaving Chemo hollow and less volatile. It's not a planned change, just a mistake, but there are a lot out there, available with both blue and black Wildcats. The name "Wildcat" may seem like a rather random thing for Ted to call himself: is it meant to describe his ferocity, or his uncontrolled nature? Well, consider the phrase "whip your weight in wildcats," meaning to successfully take on a much stronger opponent. You know, like a normal human guy fighting supercriminals. It appeared in print as early as 1829, but was still around in the boxing world at the turn of the 20th century, meaning a guy like Ted Grant, who debuted in 1942, almost certainly would have heard it used.